The Parisian theme continues into the casino area, where 90 table games are situated beneath attractive verdigris grillwork. 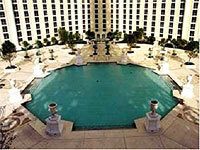 Our tables offer some of the highest betting limits and the best variety of Blackjack games in Las Vegas. In addition to Blackjack, there’s Craps, Poker, Baccarat, Mini Baccarat, Pai Gow Poker, Pai Gow Tiles, and Caribbean Stud, Let It ride and Three Card Poker. More than 1,700 slot machines are set alongside streetscapes, fountains, and statuary beneath three of the four massive legs of their Eiffel Tower. Just as Parisians enjoy some of Europe’s finest dining, visitors to Paris Las Vegas are treated to many of the Strip’s most celebrated restaurants. Couple the French-infused fare with the charming atmosphere and it’s easy to see why guests fall in love with the food at Paris Las Vegas. Looking for food of the Five-Star variety? You’ll enjoy the best-of-the-best at the world-class restaurants. Crafted inside the replica Parisian landmark, the Eiffel Tower Restaurant serves the most acclaimed French cuisine available in Las Vegas. The restaurant itself is a feast for the eyes. Sitting more than 100 feet above the Strip, the restaurant provides one of the most vibrant views in all of Nevada. You can also choose Mon Ami Gabi, the charming French bistro with al fresco dining on the Strip and Les Artistes Steakhouse, often called the most beautiful dining room in Las Vegas because of its Impressionist art and opulent surroundings. Want convenience without sacrificing quality? We also offer an outstanding variety of eateries for guests on the go. Ah Sin at Paris Las Vegas is the latest and most thrilling dining experience in Las Vegas. World-renowned chefs prepare a diverse collection from the best flavors and cooking techniques of the Pacific Rim. The distinctive decor includes dining stations with sumptuous delicacies ranging from Mongolian lamb chops to Malaysian lobster salad to a delectable array of French specialty desserts and pastries. This “Pan Asian Parisian” dining adventure is made more spectacular by its open-air, indoor/outdoor location directly on the Las Vegas Strip. High atop the illustrious Strip, crafted inside the replica landmark, Chef J. Joho’s Eiffel Tower Restaurant serves the most acclaimed French cuisine available in Las Vegas, with lamb seasoned to perfection and foie gras unlike any other. While each meticulously prepared dish is a treat for the palate, the restaurant itself is a feast for the eyes; sitting more than 100 feet above Las Vegas Boulevard, the Eiffel Tower Restaurant provides one of the most vibrant views in all of Nevada. Follow your nose to this aromatic bakery that produces baguettes (and other baked goods) for each restaurant at Paris Las Vegas. Freshly made sandwiches, soups and salads are served alongside an array of straight-from-the-oven pastries and baked goods. The pastries and baked goods are perfection! JJ’s Boulangerie is an excellent place for a light breakfast or croissant and a fresh cup of coffee. Have a quintessential French delicacy prepared before your eyes at this traditional walk-up bistro. Delicious fillings, both for dinner and dessert, are available for your personal combination. At La Creperie, you’ll find all the ingredients you need to create a sweet dessert, filling meal or light snack. Inspired by the sidewalk creperies that line the streets of Paris, La Creperie is the place to find this delicate, authentic French creation. There’s a culinary cultural exchange happening 24 hours a day at this charming sidewalk cafe that serves classic French and American dishes. Le Café Île St. Louis is the ultimate place to enjoy delicious cuisine with friends in a warm and inviting atmosphere. The charming casual restaurant is perfect for a quick bite, a relaxing meal or a late-night snack. Enjoy regional French Cuisine in a lively, old European village setting when you dine at Le Provençal. Le Provençal’s walls are covered with murals of the French countryside, a fitting backdrop for the attentive waitstaff, who dress in traditional French peasant garb and perform French and Italian songs throughout the night. Like the Provençal region in France, Le Provençal proudly serves traditional French-Italian cuisine. Among the house specialties are the Artichoke Milanese with roast garlic fondue, Le Provençal Bouillabaisse (a shellfish stew served tableside in a large, cast-iron pot) and the fresh mozzarella, tomato and basil caprese salad. Other top menu choices include the Chicken Provençal, Pan Roasted Sea Bass Filet, the Grilled Veal Chop and the tender Ribeye with Herb Butter. Further Le Provençal offers a wide variety of pizzas, pastas, chicken and seafood specialties. Good food, good drink and good song are the Old World tenets of hospitality you will enjoy at Le Provençal. Salut! A departure from the traditional Las Vegas-style buffet, this extraordinary dining experience takes buffet dining to a higher echelon by featuring live-action stations, the freshest ingredients and food cooked to order in a remarkable French village settings. Le Village Buffet brings to life five provinces of France through culinary expertise and visual attention to detail. Each station is themed for a particular province and features an intricate facade designed to replicate the architecture of that region. Meals are prepared as they are ordered to ensure the quality and freshness of each selection. A large selection of pastries, pies and an assortment of sugar-free delicacies are offered from the buffet’s dessert station. Two of the newest cooking stations include La Raclette, which comes from the French word racler, meaning “to scrape.” La Raclette features dishes made of melted cheese accompanied by a medley of cured meats, steamed potatoes, assorted vegetables and French bread. La Grillade (grill), another new station, is displayed in the window of the buffet for passersby on Le Boulevard to see and features a selection of assorted skewers of meat, seafood and sausages grilled to perfection. You’ll dine in a village-like setting, where you may choose to eat outside in the town square or in a casual dining room by a fireplace. Each province’s cottage dining room is decorated for the region. Some come for the menu, where dishes like the bone-in filet mignon, salt-crusted prime rib and an array of seafood compete for your appetite’s attention. Others choose this steakhouse for its architecture and Impressionist art, often called the most beautiful dining room in Las Vegas. Whatever your reason, you’ll find Les Artistes to be an inviting experience. It’s easy to become a Francophile at this charming French bistro that offers al fresco dining on the Strip. Although offering a terrific spot for people watching, you’d better get your looks in early. Once your deliciously simple French food is served you may soon forget your surroundings. Highlighted by classic steak frites and a variety of fruits de mer, the Mon Ami Gabi menu also boasts an extensive wine list. It’s the closest thing to dining on the Champs Elyseé on this side of the Atlantic. From the enticing two-acre rooftop pool to an incredibly luxurious spa, Paris Las Vegas has all the amenities that will make your stay with us extraordinary. You can sunbathe beside the replica Eiffel Tower while relaxing at the rooftop pool, recessed within an exquisitely manicured French garden. For a more secluded sunbathing experience, private outdoor cabanas are available for rental. Or spend a day at Paris Spa by Mandara, offering you everything you need to look and feel incredible, including the latest in body treatments and a state-of-the-art fitness center. Then relax at the exclusive Le Rendez-vous Concierge Lounge on the 31st floor. You’ll enjoy the breathtaking views of the Eiffel Tower and the spectacular Las Vegas Strip in the plush and comfortable atmosphere. Paris also offers a golf experience that’s unparalleled anywhere in the world. Created for Harrah’s customers, Cascata Golf Club brings together challenging holes and beautiful fairways with incredible views, mountains, waterfalls and rivers. Prepare to be pampered! Located on the 2nd level of Paris Las Vegas, the incredibly luxurious 26,000-square-foot Paris Spa by Mandara offers you everything to look and feel incredible! After all, you deserve the very best. Use of the fitness center with state-of-the-art fitness equipment. Use of Mandara Spa Sauna, Steamroom, Showers, Luxury Whirlpool. Complimentary fresh fruits, juices, teas, coffee and bottled water during your visit. Use of the vanity bar stocked with luxurious Mandara bath and styling products to use during your visit. Spend time in any of the stores and you’ll leave Las Vegas with more than just memories. When you shop with us you’ll discover all the treasures of Paris Las Vegas housed in two shopping promenades the Paris-Bally’s Promenade and the shops at Le Boulevard. You’ll find everything from exquisite accessories to the latest fashions when you shop with us. At Bally’s-Paris Promenade shops, you’ll find exclusive French jewelry, women’s accessories from internationally renowned designers, an art gallery shop of French and French-inspired work and much more. 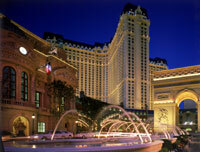 Your shopping experience at Paris Las Vegas will be unforgettable. The latest in designer lenses can be yours at this fashion-forward optical boutique. Sunglasses, eyeglasses and imaginative eye accessories are offered in a far-reaching variety of tastes. This kiosk carries an exclusive array of cigars, lighters and accessories from around the world including Honduras and the Dominican Republic. Overwhelmed by your options? Don’t worry, the professionally trained staff is on hand to help you find the cigar that is perfect for you. Customers of this exclusive French jewelry importer walk out wearing the finest European accessories. From watches to rings and anklets, every item is painstakingly crafted, elegantly designed and often made with sterling silver or 18k gold exclusive to Clio Blue. You’ll find an interesting collection of souvenirs, shirts and postcards at this quaint casino gift shop located beside the Le Pont Alexandre III Bridge on the main casino floor. Judith Jack brings its internationally known sterling silver and marcasite jewelry, handbags and watches to Las Vegas. All of these feminine fashions have been made by master craftsmen and are comprised of the finest (and often precious) materials. This elegant gallery shop offers French and French-inspired artwork that is beautifully tranquil to buyers and browsers alike. Come in and appreciate the Impressionist-style paintings, sculptures and collectibles. Casual Paris Las Vegas apparel with fashionable styling is featured at La Ménagerie de Paris. Jewelry, gift items and the signature fragrance C’est Si Bon are also available here. Chopard, Concord and Movado are just a few of the names you can expect to see at this boutique that features watches and jewelry from around the world. Need to adjust your travel? Trying to get your hands on a Las Vegas show? Le Voyage is the in-house travel agency that’s here to accommodate your vacation needs. Forget to pack for the pool? L’Oasis has you covered, literally, selling sun screen, swimsuits, sunglasses and a variety of apparel and sundry items. Paris Line features women’s wear that exceeds expectations. Designer clothing from Yves St. Laurent, Nina Ricci, Lacoste, Christian Lacroix, Newman and the private-label Paris Line are just some of the labels you’ll find at this haute store for her. The shops at Le Boulevard house boutiques, gift shops, a home and garden store, a gourmet food shop, the newsstand and much more. Luxurious and elegant stores line Le Boulevard and bring a world-class shopping experience to guests of Paris Las Vegas. Some of the world’s most renowned designer boutiques have been combined to produce an unmistakably high-end shopping encounter. Cartier, Celine, Coach, Hunting World, Hermes, Gucci, Fendi and Omega come together to provide a shopping experience that isn’t easily forgotten. Treat your friends at home to gourmet food when you bring them goods from La Cave. Premium French wines, imported cheeses, pates and delectable sweets become a wonderful import into even the most domestic of kitchens. On second thought, forget your friends take these goodies home for yourself! This boutique specializes in the unique. With elegant jewelry, scarves, designer handbags, hair accessories and fragrances, La Vogue is just the shop to find the perfect gift for yourself or a truly special friend. This 24-hour hotel gift shop features more than just Paris Las Vegas apparel, souvenirs, beverages, liquor, cigars and cigarettes can all be had, any time, day or night. Delicious croissants, baked fresh daily, pain au chocolate and a variety of authentic French pastries await you at Lenotre. But don’t let these delicacies distract you, otherwise you might miss the imported chocolates, truffles, candy, ice cream, preserves, teas and coffees that make great treats. The home and garden items at Les Eléments let you bring the flavors and styles of Paris and Provence back to your home town. Unique and charming gifts and collectibles abound, including Limoges boxes. Don’t forget the kids. This boutique caters to the petite members of your family, with exclusive children’s logo fashions and unique playthings. You’ll also find memorabilia highlighting childhood favorites like Madeline and Eloise, as well as Gigi, the Paris Las Vegas poodle and her companion, Jacques. What could be more luxurious than a European bath? Les Mémoires lets you bring that experience home, offering an array of merchandise for your bed and bath. Soaps, scented candles and body lotions complement the selection of boudoir linens, wedding giftware and home accessories on the shelves of this merchant of tranquility. Keep up with the day’s events at this Parisian newsstand offering newspapers, magazines, tobacco, snacks and sundries. Open 24 hours a day. Guests of Harrah’s six Las Vegas resorts can enjoy top-rated golf at two of the nation’s most beautiful golf courses – Cascata Golf and Rio Secco. Cascata Golf, located just 30 minutes from the Las Vegas Strip, was created exclusively for customers of Harrah’s six resorts in Las Vegas. Mountains, breathtaking waterfalls, rivers and incredible views combine with challenging holes and felt-like greens to produce a golfing experience unparalleled anywhere else in the world. No detail has been overlooked, from an opulent clubhouse and pro shop to the personal and attentive service extended to every guest of Cascata. Guests can also tee off at Rio Secco, which features unsurpassed views of the Las Vegas valley and the ultimate experience on the greens at one of the best golf courses in Vegas. Set among the rolling foothills of the Black Mountain Range, Rio Secco Golf Club provides a world-class golf experience unlike any other. This 18-hole championship course was designed by Rees Jones, Golf World magazine’s 1995 “Golf Architect of the Year,” and features stunning scenery and challenging play. Rio Secco Golf Club is located just 12 minutes south of the Las Vegas Strip. Take advantage of the Butch Harmon School of Golf and enjoy the unmatched expertise of Butch Harmon, coach to Tiger Woods and past instructor to PGA Tour notables Greg Norman and Davis Love III. Visitors will be delighted to know that Rio Secco offers new “Ben Hogan” golf sets. Why drag your clubs through busy airports? Rent quality golf clubs at the Rio Secco Golf Club. 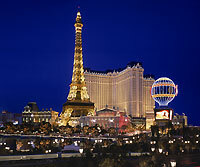 Nightfall is when the City of Light shines, and at Paris Las Vegas evening brings the same effect. Whether you’re entertaining guests, catching up with friends or looking for a romantic setting, Paris Las Vegas has a night spot that’s right for you. With seven unique bars and lounges, it’s easy to enjoy the Parisian experience anytime: day, night or well into the early morning. You can sip a cocktail and relish the Parisian atmosphere at Gustav’s, right in the vibrant heart of the casino, or sip French wines and specialty drinks at Le Cabaret, the Parisian neighborhood bar. Napoleon’s, Le Central and Le Bar du Sport all offer your favorite cocktails, convenient locations and a spot in the middle of the action! Take in the expansive view of the casino floor, or partake in one of the many built-in video gaming machines, at this stocked bar in the center of the action. Located at the southeastern leg of the Eiffel Tower, Gustav’s makes a great drink and a great place for people watching. Le Cabaret is a charming, open lounge designed to create the feeling of sitting outside in a garden area. Live entertainment entices the guests to sit at bistro tables and enjoy their drinks under trees laced with twinkling lights. Melodic live jazz fills the air, as champagne glasses clink at Napoleon’s, Las Vegas’ premier Champagne Bar. In addition to a full-service bar, there are more than 100 carefully selected varieties of champagne ready to be sampled. Happy hour in the plush surroundings of Napoleon’s is a feast for the senses. Picture fresh rolls piled high at the carving station next to freshly grilled pepper-crusted top round steak, mustard-rubbed roast turkey, and wine-braised pork loin. The carving station is complimentary with the purchase of an alcoholic beverage during Happy Hour. With an elevated view of the Paris casino floor, the elegant Lobby Bar serves a wide selection of beverages. Located beside the Race & Sports Book, Le Bar du Sport has large screen TVs so the guests may view their favorite sports as they sip their special drinks. The exclusive Le Rendez-vous Concierge Lounge is located on the 31st floor of Paris Las Vegas. Relax in a plush and comfortable atmosphere while enjoying the breathtaking views of the Eiffel Tower and the spectacular Las Vegas Strip, for a nominal daily fee, based upon availability. A signature of the Las Vegas skyline, the replica Eiffel Tower at Paris Las Vegas is an exact reproduction of one of Europe’s most famous landmarks, rendered meticulously at 1/2 scale. The Eiffel Tower Experience allows you to ride to the top, where you’ll have a stunning, panoramic view of the valley, from 460 feet above the ground. Along the way, an experienced elevator operator will point out can’t-miss Vegas landmarks, as well as address any questions you may have. And don’t miss the Eiffel Tower Restaurant, located on the 11th floor, for breathtaking views of the Strip. A two-thirds replica of the original Arc de Triomphe is located right outside the hotel’s front entrance. The names and dates of Napoleon’s victories are inscribed on the monument. Located above the casino, this is a 50-story, half replica of the Eiffel Tower, originally built to celebrate the 100th anniversary of the French Revolution. Visit the French restaurant on the 11th floor for a breathtaking view of the Strip. Or take the elevator all the way to the top-floor observation deck. The original opened in 1793 and is now the richest museum in the world, housing the “Mona Lisa” and “Venus de Milo.” The replica of the Louvre facade is located on the north corner of the casino front. The original Paris Opera House had a stage large enough to hold a cast of 450 performing artists. Visit the replica of the Paris Opera House facade at the south corner of the casino. Now the Paris City Hall, the original Hotel de Ville is 800 years old. The replica of this historic landmark is located behind the casino.